These remarks cover my impressions upon having seen episodes 1-12 of Durarara!! (henceforth DRRR). DRRR is the second anime based on the works of light novelist Ryohgo Narita. Like the earlier series (Baccano! 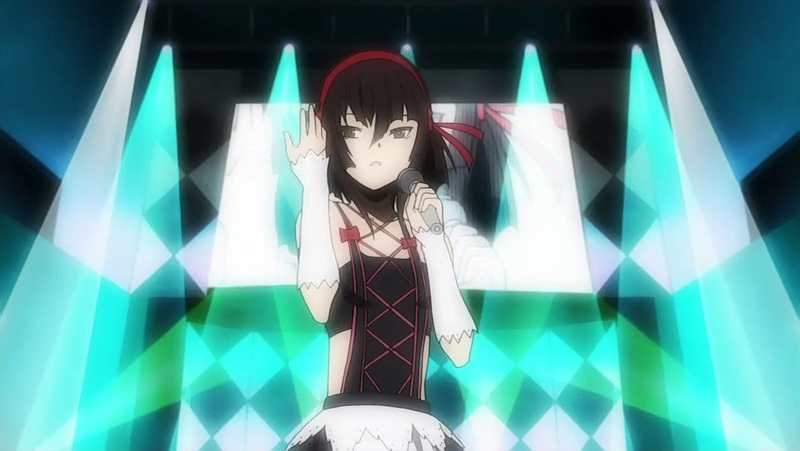 ), DRRR is a product of studio Brains Base. Both projects also feature the team of director Takahiro Omori and series editor Noboru Takagi (see this great description of the role of the series editor in the anime production process). DRRR is a story set in modern Tokyo (specifically the Ikebukuro district) that includes some supernatural features. If you haven’t watched episodes 1-12 yet, I recommend this show highly, but it is not critical to watch them before reading this review, because it contains, at most, minor spoilers. One commonality between DRRR and Baccano! is that both shows feature a somewhat large cast, with multiple narratives intermingling. In truth, I had expected an even more complex approach to storytelling based on having seen Baccano!, but DRRR manages to keep the complexity from overwhelming the viewer. Once again, all the significant characters are introduced in the excellent OP, which gives you an opportunity to learn their names, and in some cases, wonder just what role they will play as you wait for them to take their turn in the spotlight. Some things that stand out about the OP (besides the engaging music that always gets me excited to watch the show). Several characters are shown in groupings that are significant later on. 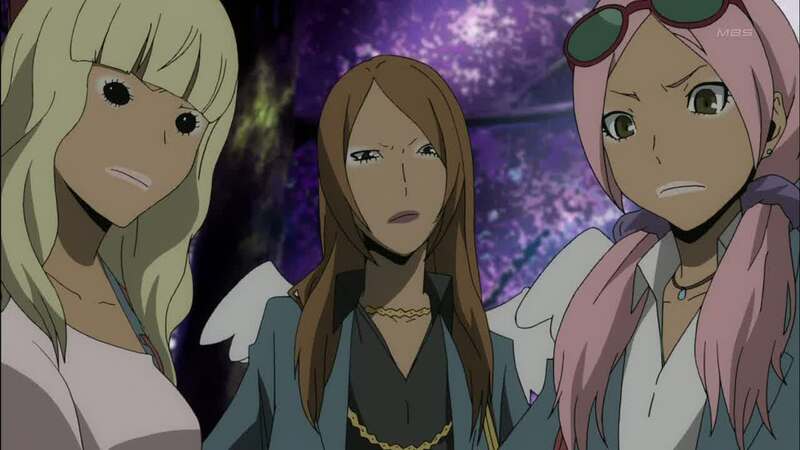 For example, Mikado, Masaomi, and Anri are shown together, Shizuo and Izaya are shown to be fighting, and Mika and Seiji are implicitly connected to Namie via the phone call. Also some rather odd things are shown with minimal attempt to hide them. First, Shizuo demonstrates incredible strength by throwing a trash can that looks like it was bolted to the ground, second in the last couple of seconds before the end, a couple of very suggestive images are shown, including a head in a jar, and Celty with some sort of elongated scythe. This approach is fairly typical of DRRR, the viewer is presented with a lot of information, but often not quite enough to understand its true import. Although the show features a very strong cast of interesting characters, the show really isn’t character-driven, in the sense that the show principally concerns itself with the characters whose strengths and flaws ultimately drive the show. Instead DRRR is principally concerned with plot and mystery. What is going on? Who is behind it? Can we even believe what we just saw? The first episode introduces us to a country bumpkin newly arrived in the big city. We see Ikebukuro for the first time through his eyes. Mikado is shown around by Masaomi, an old friend who has been living in Tokyo, who comes across as much more street smart. While this duo roam the streets, encountering many strange people, even stranger events are glimpsed by the viewer, who has the first opportunity to ask, “Did I really see that?” The only reassurance offered by our in-anime narrator is that there is something “amazing” in Ikebukuro, an urban legend that can be seen with one’s own eyes riding a black motorbike. The second episode opens with the question, “Is the ‘reality’ you see actually real?” The episode then goes on to undercut some of our first impressions by showing us some of the same events we had witnessed in episode one, but from a new perspective. The episode’s narrator (or perspective character) is also changed, which becomes the pattern for the series, switching narrators with every episode. For me this was the episode that really grabbed my attention, and told me that I was going to love this series. It’s also the episode in which we meet a character who loves humans, in much the way a bug-collector loves bugs. I don’t intend to do an episode-by-episode breakdown, but I do want to point out some things about episode three. This episode is very notable because it generated a lot of excitement in the ani-blogging community, making, I am sure, many new fans of the series. This was the first episode to really feature comedy, thus changing the tone of the series (especially in comparison to episode two). It also confirms the practice of undercutting the viewers expectations, not by proving that what we expected was wrong, but by layering new information that allows inconsistent theories to develop. The tension produced by perpetual cognitive dissonance is, I believe, an essential part of the show, so I’ll give two examples from episode 3. First, this episode caused me to re-evaluate Izaya Orihara, ever since I have been unable to consider him a well understood factor in the show; instead he simply resists explanation. Second, Simon makes a dramatic entrance late in the episode that, despite his explicit explanation continued to engage me, to the point that I expected some sort of clarification or amplification as the series progressed that, as of episode 12, has not appeared. Was it all a red herring? Or are we being set up for revelations that will only come in the second half of the series? If DRRR were a shell game, episodes 1-4 would be the shell man’s patter and the placement of the pea. Episodes 5-8, then, are the artful shuffling of the shells. Watch them move. Yellow Scarves. Slashers. Sushi. Ruri Hijiribe? Since this is a mid-series review, nothing can be said about how satisfying the final ending is, but at mid-series several things do get wrapped up, giving the show a sense of an intricate, but meaningful narrative. New twists are presented, but they are handled fairly, so this viewer didn’t feel ripped off, despite the fact that he wasn’t able to reliably pick which shell was hiding the pea. 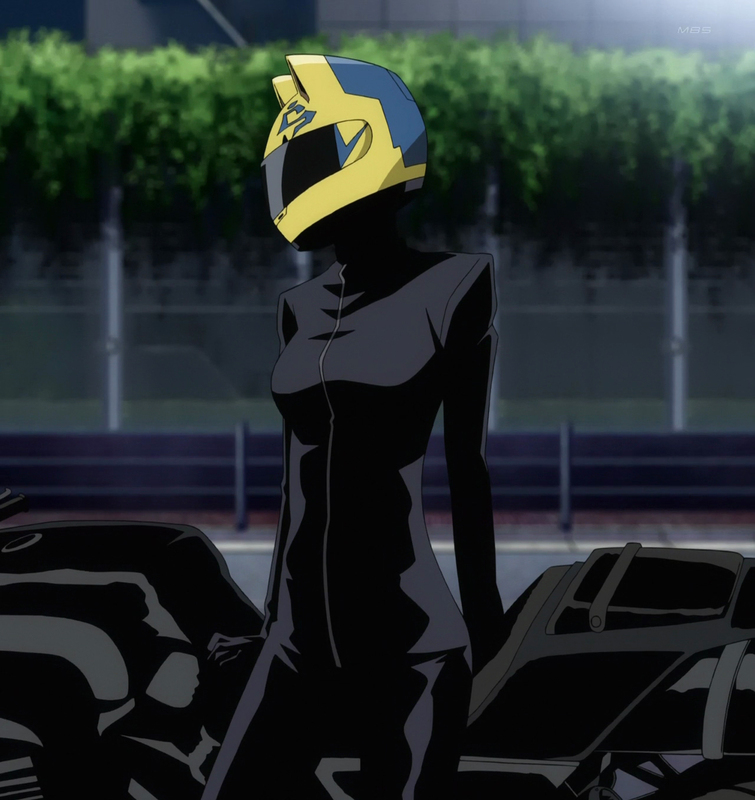 Thanks: By the way, thanks to Scamp, the Cart Driver, from whom I grabbed the image of Celty; Kanzeon at Metanorn, from whom I got the image of the girl gang; and Obsidian609 at Anime Vice for the image of Ruri Hijiribe. I really like the (presumed) shift in story focus with the end of ep12. Instead of mostly slinking in the background, it seems as if Izaya will take a more assertive role, which can’t be good for anyone else in the series, haha. Looking forward to the other storylines — the Slasher, whatever is up with Anri, Kida’s past, etc. — getting some attention as well. Yeah, it is going to be really interesting to see where things go from here. I really want to see what the deal is with the slasher. Ever since we first saw him/her, it’s been such a mystery and they haven’t really gone back to explain it recently. We will undoubtedly see them explore this soon, so it’s gonna be hella interesting. I wonder who the main antagonist is: the slasher or Izaya? Yeah! Before episode 12, I was assuming the second half antagonist would be the slasher, but Izaya managed to stake a credible claim on that title in the last few minutes.